Tomorrow is Mother’s Day in the United States. It’s a day where churches will be filled. In fact it’s one of the 3 most popular days for people to attend church services-Christmas, Mother’s Day and Easter. Tomorrow is one of the greatest opportunities to share with the world what Christians do. In light of Mother’s Day, let’s celebrate mothers not just in the United State but around the world. 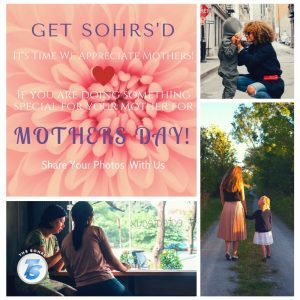 Our Get Sohrs’d focus today is simple… [Heart, our social media posts on Facebook, Twitter and Google+] if you are doing something special for your mother this Mother’s Day! Share your photos with us as well. It’s your time to do something special and impacting. Let’s Get Sohrs’d!